Patience, hard work, ambition, and pleasant conversation finally produced electoral victories to accompany the accolades that have become a USN tradition. Fifty-four students from all four grades in the High School spent this past weekend in downtown Nashville attending the Youth In Government conference sponsored by the YMCA of Middle Tennessee’s Center for Civic Engagement. 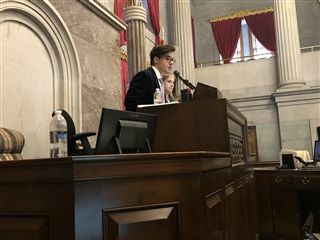 YIG is a simulation of Tennessee state government and a hands-on opportunity for students to learn about state government and the legislative process. Students from all over the state gathered to debate and discuss the bills they wrote. In doing so, they learned how to build a consensus across a wide political spectrum of beliefs and experiences. 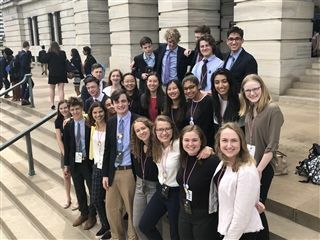 Students new to the program participate in the Blue (no partisan connection intended) legislature, divided between the House of Representatives and Senate. In this component, novices to the program get to learn the basics of Tennessee law and parliamentary procedure. Experienced students participate in the White (experienced underclass students) and Red (seniors) legislatures. They are held to higher standards of parliamentary rules and legislative parameters, including the expectation to pass a budget for the state government. Students may also participate in a State Supreme Court component by arguing an appellate case before a panel of student justices. Students with little or no experience argue in the Appellate Court, while students with experience argue in the State Supreme Court. 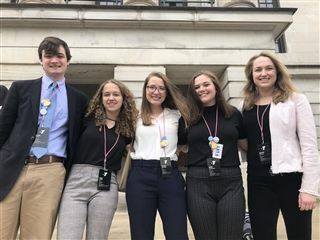 Tennessee’s YIG program is among the oldest and largest programs in the country, and USN students have been participating in it for decades. Over the years, those alumni established USN’s reputation as a school whose students are ready, even as novices, to raise the expectations for discussions over law and policy, and this year’s USN delegation lived up to that tradition. This year provided a twist, though, so keep reading to learn more. 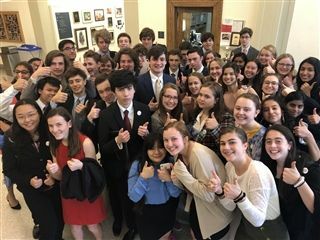 In the Blue House of Representatives, Isaac Chomsky ‘22 and Greta Li ‘22 were nominated for Outstanding Statesman Awards, and Ethan Li ‘21 won his Outstanding Statesman Award for his participation in debate and the presentation of their bills. Greta Li and Jude Warren ‘22 won an Outstanding Bill Award for their bill to eliminate cash bail and institute a pretrial risk assessment program for people accused of crimes. In the White House of Representatives, Nick Key ’20 served as the Sergeant-At-Arms for the chamber, while Wei Dai ’20 served as the Floor Leader, responsible for guiding the presentation and debate on the bills in the chamber. Neha Saggi ’21 and Lydia West ’21 were both nominated for Outstanding Statesman, while classmates Lauren French ’21 and Erica Friedman ’21 each won an Outstanding Statesman Award, each one as a unanimous choice by the members of the awards committee. In the White Senate, Claire Kim ’20 was Lieutenant Governor, Yoshi D’Souza ’20 was Lieutenant Governor Pro Tempore, and Nicholas Clancy ’20 was Floor Leader. Arushi Mehta ’20 and Aasha Zinke ’20 each won Outstanding Statesman Awards for their efforts. In the Red House of Representatives, Sam Horner ’20 served as the Speaker of the House Pro Tempore. Cole McMillan ’20 was nominated for Outstanding Statesman, while Jason Kuchtey ’20 won Outstanding Statesman, particularly for his efforts as the sponsor of Senate bills being presented to the House. In the Red Senate, Evan Rork ‘19 and Annie French ‘19 were nominated for Outstanding Statesman Awards, while Grace Rieniets ’19 and Zoe Light ’19 each won Outstanding Statesman Award. USN students also impacted the Court components. Caroline Sigmund ’19 served as Chief Justice of the Supreme Court, while Hannah Laibinis ’19 served as Appellate Justice and managed the Appellate Court level for beginning lawyers. Laibinis’s leadership shone in difficult circumstances as myriad challenges kept the Appellate Court on the move and dealing with fluid situations; one school’s advisor described her as “the adult in the room.” For her efforts, Hannah earned the Jenny Faenza Memorial Outstanding Justice Award. Neha Mehta ’20 served as Clerk of the Supreme Court and kept things running in chambers and in the paperwork as well. In the Appellate Court, the lawyer teams of Anne Griffith ’22 and Ainsley McMillan ’22 and Wiley Barzelay ‘21 and Lucas Heckers ’21 advanced rapidly through their rounds of argument. Barzelay and Heckers qualified for the Final Round and won the case, earning the Outstanding Appellate Court Lawyer Team. In the Supreme Court, the teams of Nicholas Beem ‘21 and Philip Ratliffe ’21 along with Michael Gordon ’21 and Steven Tarleton ’21 also made progress through the rounds of argument. Gordon and Tarleton, on the strength of their Best Novice Brief Award, qualified for the final round and won the case along with the Outstanding Novice Lawyer Team Award. 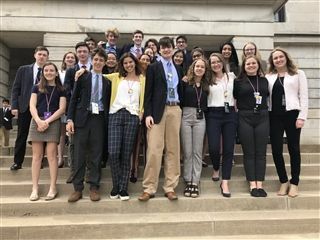 This year’s awards and achievements were rounded out by Laibinis being a unanimous selection to represent Tennessee at the YMCA’s Conference on National Affairs (CONA), which brings together the ‘best of the best’ YIG participants from all over the country. Kim was selected as an alternate for the Tennessee delegation. Finally, USN students made electoral bids for election to the highest offices at the Conference. Olivia Rhee ’20 ran for Floor Leader, Clancy ran for Speaker of the Red House, Horner ran for Red Lieutenant Governor, and Kim ran for Governor—the first USN student to do so since Cyrus Shick ’13 and only the fifth USN student to do so in the history of the program. And our students rose to the challenge and convinced their student peers to put them in office. Next year’s Speaker of the Red House will be Nicholas Clancy ’20; the Red Lieutenant Governor will be Sam Horner ’20, and your Youth In Government Tri-Star Conference Governor will be Claire Kim ’20, who made history as USN’s first student governor at the conference. Also serving in conference leadership next year will be Neha Mehta ’20 as Clerk of the Supreme Court (again), Nicholas Key ’20 as Red Legislature Engrossing Clerk, and Jason Kuchtey ’20 as Sergeant-At-Arms of the Red Senate. What a year for USN at YIG. Please congratulate these students when you see them. YIG Regulars from the class of '19. A slightly better group picture. The students ready to go on Thursday morning.